During the final week of January, Duke University students were fortunate to receive a visit from 36 Chinese students from Zhuhai No. 9 Middle School. Each summer, Zhuhai becomes the home and workplace of a group of DukeEngage students; however this winter, the Duke community reciprocated by bringing its Zhuhai family to campus. After spending the week at area middle schools engaging in American culture, Zhuhai No. 9 Middle School students joined DukeEngage Zhuhai alumni at Duke for a day packed with activities. This cultural exchange had its roots in both a global education initiative from New Garden Friends School, and the DukeEngage in Zhuhai program, which has fostered a strong relationship with the Chinese school over the past six years. This DukeEngage program encourages personal and creative growth by providing arts education and English lessons to middle school students. The visit granted Zhuhai No. 9 students and the DukeEngage alumni a chance to reunite with the friends they had made in China over the eight-week program duration. Passionate alumni of the program worked to plan a fun day for the visiting students, including a trip to Cameron Indoor Stadium, a visit to the Nasher Museum, and a variety of artistic performances. Deja Blue, one of Duke’s a capella groups, sang for the students in the Duke Gardens before lunch at the Bryan Center. Afterwards, at the Arts Annex, Zhuhai students enjoyed a dance showcase from various dance group members, as well as a Chinese Yo-yo performance by Felix Kung, and a contemporary dance solo from Riley Reardon. Each of the performances were led by DukeEngage Zhuhai alumni and enabled the middle school students to experience as much as the University as the day would allow. Prof. Hsiao-Mei Ku, leader of the DukeEngage in Zhuhai program, later hosted more than 90 Duke and Zhuhai No. 9 students for Chinese food at her apartment on East Campus. She recounted how amazing it was to see the huge Zhuhai family come together to learn from and laugh with each other once again. After transportation conflicts due to snow, Sagar Patel (DE Zhuhai 2015) took initiative to quickly plan a rescheduled visit. Patel recalled his 2015 summer in Zhuhai and stated that his love for the Chinese school, his host family, and his students motivated his leadership in preparing the visit. He hoped to provide his friends and students with an enriching American experience similar to the one he received in Zhuhai. The Duke community agrees that Patel, Ku, and the rest of the DukeEngage in Zhuhai community succeeded in this goal, ensuring that Zhuhai No. 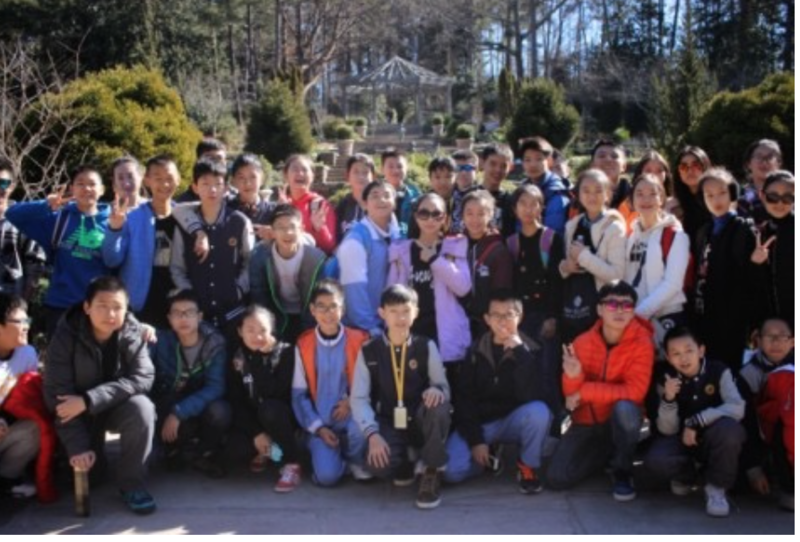 9 Middle School students had a chance to reconnect with their DukeEngage brothers and sisters before returning to China. Read another article about the visit at DukeToday.